The primary text here is a response by two members of the al-Qaeda loyalist Hurras al-Din to Abu Hussein al-Urduni of Hay'at Tahrir al-Sham (HTS). Urduni apparently made some serious allegations against Hurras al-Din in words that were addressed to members of HTS and then came to public light. For this reason, the two Hurras al-Din members say they have been compelled to respond in public. The two men were previously officials in Jaysh al-Badiya and Jaysh al-Malahem. These two groups had a document presence on the ground prior to the announcement of Hurras al-Din's existence at the end of February 2018. The two groups then declared that they were joining the al-Qaeda loyalist outfit after Hurras al-Din's existence was declared. Below is my translation of the text, which is largely self-explanatory in comparison with prior texts in this series. Parenthetical insertions in square brackets are my own. Praise be to God alone who has fulfilled His promise and supported His servant and made His soldiers mighty and has defeated the parties alone, and prayers and peace be upon the one after whom there is no prophet. The Almighty has said: "Oh you who have believed, fear God and say what is right. He will make right for you your deeds and forgive your sins. And whoso obeys God and His Messenger has attained great reward." We were surprised by the words of the brother Dr. Abu Hussein al-Urduni, charging us with accusations and falsehoods for which God did not bring down authority. And since the words have spread in public, we have been obliged to respond in public to make clear the truth to our soldiers and our brothers, the soldiers of the commission [HTS], so we begin seeking help in God. Regarding the path on which Hurras [al-Din] is going today, it is the path on which our leaders previously and Jabhat al-Nusra formerly went, not distorting, altering or changing: remaining steadfast on the covenants and pledges until we meet God and we are glorified. As for the lack of participation by Hurras in Sharq al-Sikka, we participated in the fighting of Sharq al-Sikka [extended battle in which hundreds of jihadis were killed] before the existence of Hurras al-Din and those who participated are components prior to the formation, at the head of them the al-Malahem sector [Jaysh al-Malahem] and Jaysh al-Badiya and the al-Sahel [coastal area] battalions and other ansar [local Syrian] brothers. And we offered the best of our men from field commanders and soldiers, whose blood was mixed with blood of the soldiers of the commission and the Turkestanis [Uyghurs: especially in the Turkestan Islamic Party] and the near and far know of that. As for accusing us of conciliating with the factions, we have made clear our Shari'i position on this infighting to all and the matter was not conciliation but rather we complied with the directives of the 'ulama of the jihad and our wise leadership [i.e. the authors are referring to Hurras al-Din's rejection of participating in infighting between HTS and more mainstream Syrian rebel groups]. As for what has been attributed to us about our defending the Dawla group [Islamic State] in Sarmin [town in Idlib], our Shari'i stance on them is clear and there was the alliance of Nusrat al-Islam between us and our brothers in Ansar al-Tawheed [jihadi group with origins in Jund al-Aqsa] and there were present in Sarmin bases for the brothers in Ansar al-Tawheed and Hurras so we asked the commission not to enter Sarmin except by coordination with us in order to restrain tyrannical conduct that had occurred in the first place. As for accusing us of reprimanding our soldiers because of their participation in Saraqeb [town in Idlib], this is a lie for which God did not bring down authority, and we were among the witnesses to the events of Saraqeb. As for the agreement of 16 clauses that many buzz on about [cf. here], Sheikh Jowlani cancelled it in one of the meetings between him and Abu Humam al-Shami at the beginning of the occurrence of the first infighting with the factions. As for the suspicion of our including transgressors and extremists: by the grace of God Almighty, we in Hurras al-Din have a clear position on the issue of transgressing and extremism and it is to ban that, forbid it and hold to Shari'i account those who engage in such conduct. And we will not allow anyone from these types within our ranks. And we in this place warn the mujahideen generally from muhajireen and ansar of what is being plotted from the plotting of the enemy against the jihad of al-Sham for today the son of the disbeliever Lavrov [Sergey Lavrov: Russia's Foreign Minister] affirmed that establishing the constitution has entered into the final stage and we have been distressed today by conferences that have occurred in Idlib calling for a national army including Euphrates Shield [Turkish-occupied north Aleppo countryside from Azaz to Jarabulus] and Olive Branch [Turkish-occupied Afrin area], while those in the conference say that they want to restore Syria as a democratic state after God made it mighty with Tawheed and jihad [cf. here]. 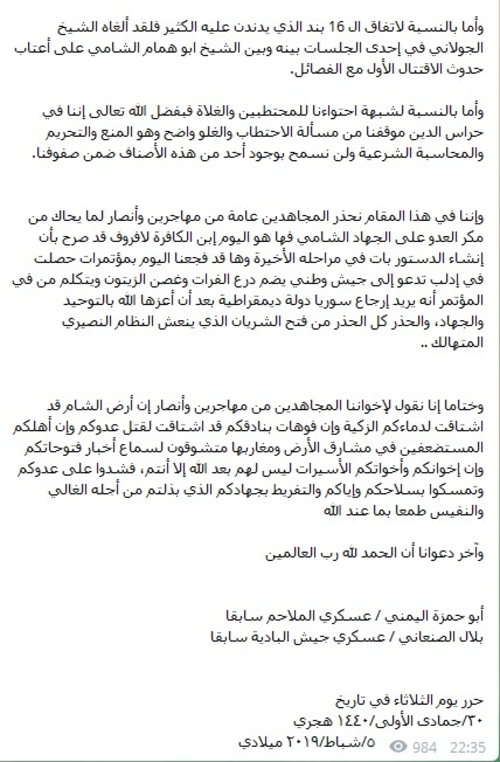 So beware of the opening of the artery that revives the exhausted Nusayri [Alawite] regime. And in conclusion we say to our mujahideen brothers from muhajireen and ansar that the land of al-Sham has longed for your pure blood and openings of your rifles have longed to kill your enemy and your oppressed people in the west and east of the land desire to hear the news of our conquests. And your brothers and your sisters in prison have nothing after God except you. So attack your enemy and hold to your arms and beware of neglecting your jihad for whose sake you have expended what is precious and dear in desiring what is with God. And the last of our calls is praise be to God the Lord of the Worlds. 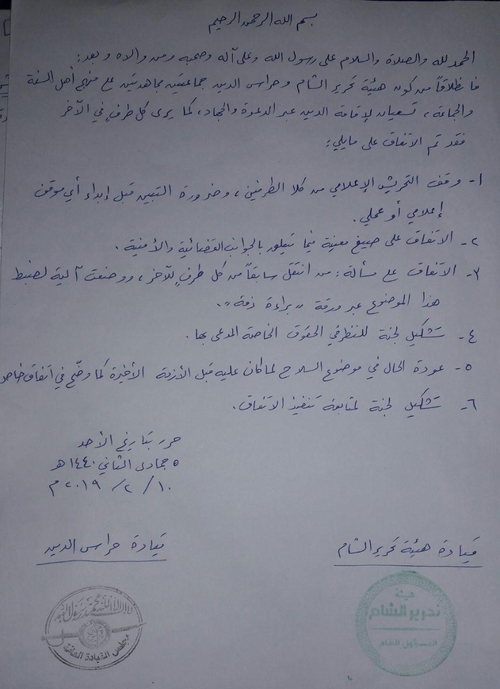 (Update 10 February 2019 CE): It is worth noting that a written agreement between Hay'at Tahrir al-Sham (HTS) and Hurras al-Din has emerged this evening, touching in general terms on broader issues raised in the recent round of disputes. The agreement also emphasises general affinity between HTS and Hurras al-Din. 1. Stopping media provocation from the two sides and the need for ascertaining before expressing any media or practical stance. 2. Agreeing on specific formulae in what concerns the judicial and security aspects. 4. Forming a committee to look into particular [/private] claimed rights. 5. Returning of the state of affairs on the issue of arms to what it was before the recent times as has been clarified in a private agreement. 6. Forming a committee to track the implementation of the agreement.